A shutout over No. 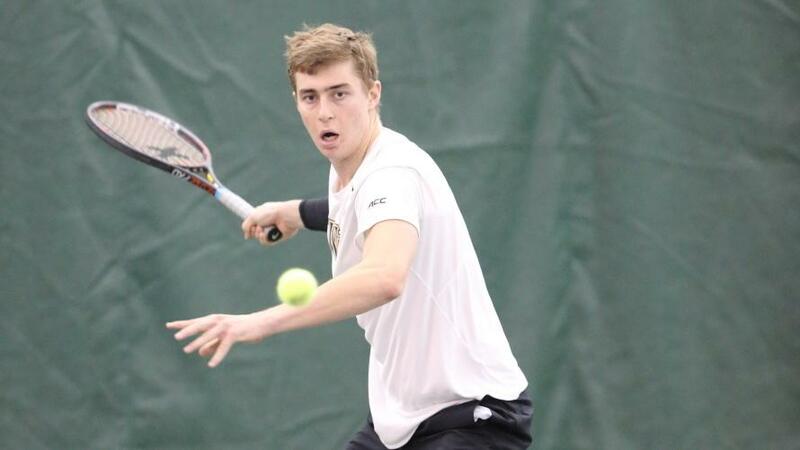 16 ranked Mississippi State on Friday, Feb. 17, in Charlottesville, Virginia, allowed our Demon Deacons to advance to the quarterfinals of the 2017 National Team Indoor Championship (ITA). An important victory came from freshman Borna Gojo, from Croatia, and redshirt freshman Alan Gadjiev, from Uzbekistan, as they defeated their opponents setting the tone for a team doubles win. That was followed by convincing performances in singles, as no match was ever in doubt. Though No. 11 Texas attempted a late rally, they were unable to defeat Wake Forest as the Deacs advanced to the semifinals of the ITA on Saturday, Feb. 18.
junior Skander Mansouri, from Tunisia, and redshirt junior Christian Seraphim, from Germany, beat their ranked opponents with a 7-5 win. In singles, Alan Gadjiev had a clutch 6-4 third-set victory, which allowed the Demon deacons to savor a narrow 4-3 win. match 4-3. However, there was a strong showing in the middle of the lineup, which showed how well rounded our team really is. Christian Seraphim, No. 26, defeated his ranked opponent 6-3, 3-6, 6-3, while junior Dennis Uspensky defeated his adversary 7-6 (7-1), 6-4. To better understand some of the factors behind the team’s solid performances, the Old Gold & Black sat down with redshirt freshman Alan Gadjiev. How does your strategy change when you play singles versus doubles? In doubles, I usually put a lot of pressure on the returner of the serve by standing in the middle of the court and as close to the net as possible. During singles, my tactic completely changes since the points are much longer. I tend to go after my first serve a lot more and try to work the points from the baseline. How important is it to put an early victory on the board for your teammates? Obviously, I try my best to get the doubles point for my team, but I have confidence that, even if we take an L in doubles, we will bounce back in singles. Are you aware of scores on the other courts when you play? Even though I try not to look at the score-board I am aware of what’s happening on other courts. Wake Forest, in the middle of a seven-game series, continues play against the University of Tennessee this Saturday, Feb. 25.